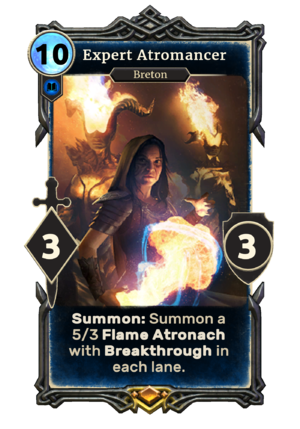 Summon: Summon a 5/3 Flame Atronach with Breakthrough in each lane. Expert Atromancer is a legendary Intelligence creature card. "Can you handle us both?" "You're no match for me." "This is going to be messy." This card was previously part of the training mechanic where it could be upgraded into Supreme Atromancer at level 40. The card's art depicts a female magic user with two Flame Atronachs. This page was last modified on 16 February 2019, at 16:26.